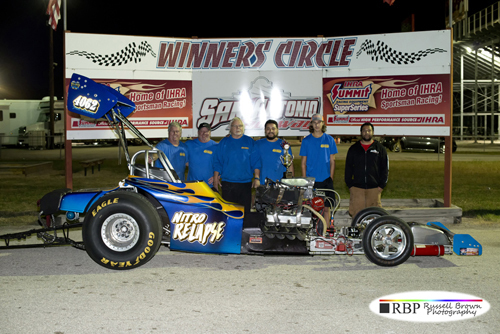 First out for round one was none other than Poloson in the "Sundown" nitro burner alongside number two qualifier Reep. Poloson had to win this pair and run one of the two quickest winning elapsed times of the round to advance him to the final. At the hit of the throttle, Poloson took the starting line advantage and never trailed, posting a winning 4.19 at 141 mph which was likely not quite what the team had hoped to put on the board. Dawson just saw his friendly rival win first round and fired up the "High Octane" car in the next pair alongside defending event winner Donnie Massey. This was no easy match for Dawson but he proved he was ready for the challenge as he took an impressive holeshot win. Dawson's 4.02 at 174 mph advanced over Massey's quicker but losing 4.02 at 182 mph. With this win, Dawson and company locked in their first Outlaw Fuel Altered Association Championship, a well-earned and hard fought victory. 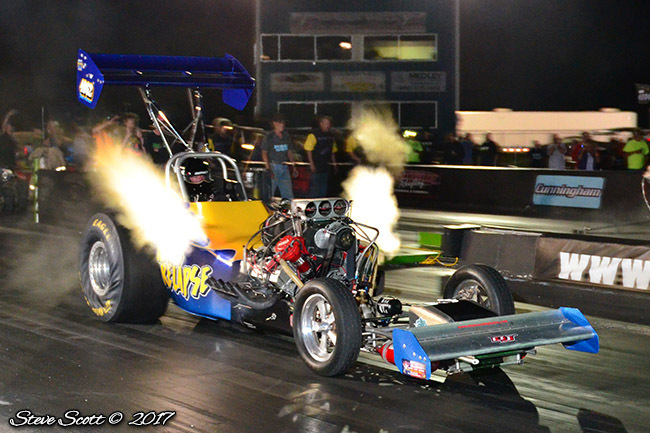 As round one eliminations continued, Eric Buchanan blasted header flames high to a stellar 3.83 at 177 mph to defeat Donny McSwain's solid 3.97 at 175 mph. In fact, McSwain's 3.97 was the third quickest pass of the round, but fell against the wrong opponent. Top qualifier Billington was out next with former five time Champion Jimmy Jones in the other lane. Billington charged hard off the line and his 3.79 at 171 fell just under of the first round cap as Jones' 4.03 at 173 mph took the win. The two quickest winners Dawson and Buchanan were final round bound in San Antonio. Dawson had nothing left to do but cap off a Championship winning dream weekend with a win here which would mark his third straight event victory, an incredible accomplishment that charged him to the top of the points standings. Dawson would have to get around the quicker Buchanan who's Terry Darby tuned nitro powered entry was looking to claim the final win of the season. In the final, Dawson took a massive starting line advantage and posted a 4.03 at 178 mph to defeat Buchanan's 3.75 at 191 mph which fell under the eliminations cap. 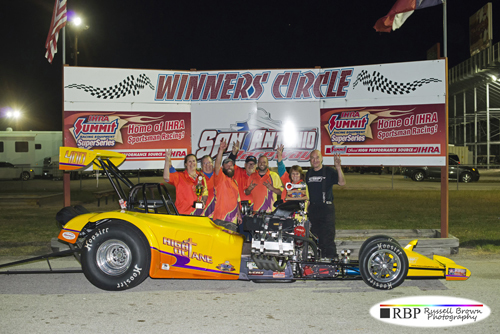 What a weekend for Dawson and company who used consistently strong performances to claim victory at the final three events in a row, resulting in a very impressive 2016 Outlaw Fuel Altered Championship run. Congratulations to the entire team on a stellar effort. The Outlaw Fuel Altered Association would like to thank Lone Star Forklift, Good Vibrations Motorsports, Meyer Enterprises and Grim Reeper Racing for their support this season. With a first time Champion crowned the anticipation for what's to come in 2017 is overwhelming. We hear rumors of a return from Bobby Marriott and team "Shockwave" who were out all season after a wild incident at the season opener. Doyle Smith's "Chemical Reaction" entry is also expected to return and word in the pits is DoDad Burton hopes to compete as much as possible in 2017 after sitting out a season. Big fields and big fun are expected as the twenty first consecutive season of OFAA racing will kick off sometime next spring. Keep an eye on www.ofaa.net for news and schedule announcements and we'll see you next year!